This is part 2 of this series. In this part, we will focus on creating the Forex Microservice. How to create a JPA Entity and Resource? How to get Spring MVC, Spring Boot, JPA, Hibernate and H2 to work together? Forex Service (FS) is the Service Provider. It provides currency exchange values for various currency. Let’s assume that it talks to a Forex Exchange and provides the current conversion value between currencies. The request above is the currency exchange value for EUR to INR. In the response, conversionMultiple is 75. 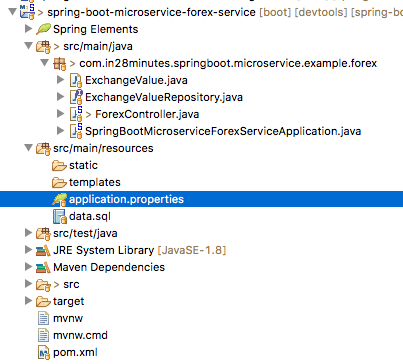 SpringBootMicroserviceForexServiceApplication.java - The Spring Boot Application class generated with Spring Initializer. This class acts as the launching point for application. pom.xml - Contains all the dependencies needed to build this project. 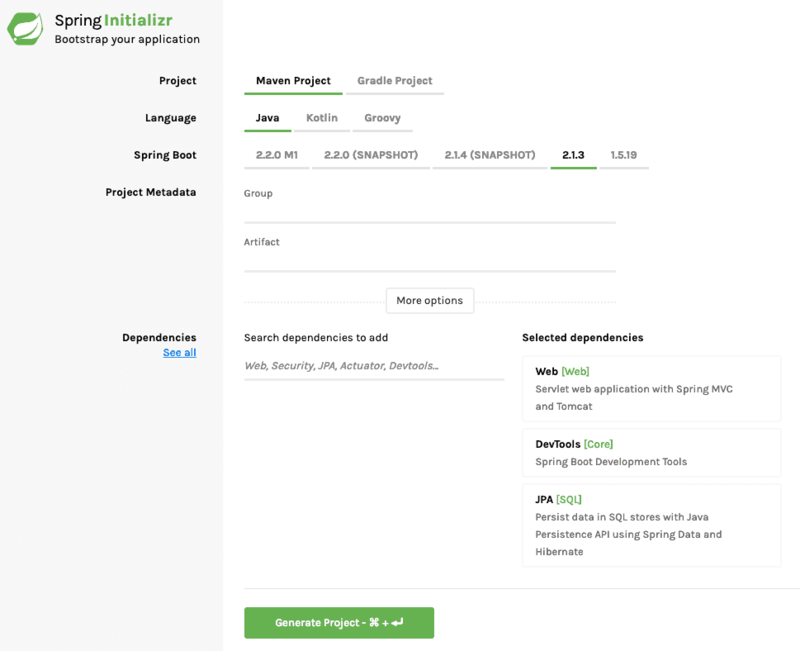 We will use Spring Boot Starter Web and JPA. ExchangeValueRepository.java - ExchangeValue JPA Repository. This is created using Spring Data JpaRepository. ForexController.java - Spring Rest Controller exposing the forex conversion service. data.sql - Initial data for the exchange_value table. Spring Boot would execute this script after the tables are created from the entities. public interface ExchangeValueRepository extends JpaRepository<ExchangeValue, Long> - We are extending JpaRepository using two generics - ExchangeValue & Long. ExchangeValue is the entity that is being managed and the primary key of ExchangeValue is Long. ExchangeValue findByFromAndTo(String from, String to); - We would want to query the conversion value from one currency to another. We are defining a query method for it. @Autowired private Environment environment - We would want to return the server port back. This will help us identify which instance service is giving the response back. @Autowired private ExchangeValueRepository repository - Autowire the repository. ExchangeValue exchangeValue = repository.findByFromAndTo(from, to) - Get the exchange value from the database. exchangeValue.setPort(Integer.parseInt(environment.getProperty("local.server.port"))) - Get the port from environment and set it into the response bean. We are assigning a port of 8000 for this application and enabling debug logging. Let’s insert some test data by creating a file called data.sql. Spring Boot Auto Configuration ensures that this data is loaded up when application starts up.